*** Time For Retired Military Personnel In Bureaucratic Roles? The stunning victory of National Democratic Alliance (NDA) in 2014 rested on its promise of reforming India, and Prime Minister Narendra Modi has repeatedly committed himself to this objective. There has been discussion ad nauseam on administrative, police, judicial and economic reforms ever since India got independence. Is the NDA government also going through the same path? If yes, then the results are known. The United Progressive Alliance (UPA) couldn’t deliver, possibly due to the avarice of its political leadership – which culminated in massive scams. NDA-II has surely performed extremely well on transparency and honesty. However, there is a sense of exasperation expressed privately by leaders, of being let down by the bureaucracy and feeling hurt by hidden ‘landmines’. We have a raksha mantri working overtime to see that the value gets delivered to the soldier in time, and we have a pradhan sewak, who is yet to take an hour off since he assumed office after the most grueling campaign we have seen in decades. The art of war has transformed from causing physical damage to assets to the manipulation of minds and the battlefield is now open to anyone with access to the internet. Warfare has been a quintessential element of humanity. More contenders fighting for less resources has been the definition of war (as indeed also the raison de’etre of business). Starting from land, warfare evolved across different theatres. As humans became capable of building sea faring vessels, the theatre moved into oceans. The First World War debuted the third dimension with aircrafts used for reconnaissance and during the Second World War it was in the form of weapon platforms, bombers, logistic supply chains and of course as a thermonuclear delivery vehicle. During the cold war, conflict propelled into the next dimension as the superpowers fought to dominate outer space and finally the 20th century witnessed advent of cyberspace as the fifth dimension of war. Warfare evolved along two vectors. The first was technological development within the dimension, for example, swords and spears gave way to muskets, rifles and machine guns. Horses and chariots were replaced by vehicles and tanks and so on. The second vector was an orbit shift from one dimension to the other. This necessitated changes in the very doctrine of warfare itself. For example, in land warfare, it was possible for the supreme commander to give out detailed orders and micromanage the campaign, requiring his subordinates to report progress and review plans at every stage. When Egypt opened its 2011-12 election season, the first election to be held since the end of the Arab Spring, the country's political atmosphere came alive with promise and debate. At the time, I lived in the coastal city of Alexandria, where "let's give them a try" had become the refrain of my religiously conservative Egyptian friends. They were referring to the Islamist Muslim Brotherhood candidates who were flooding the parliamentary tickets, figures who had never before been able to challenge the military leaders who had ruled Egypt with a tight grip since the 1950s. "But they're not experienced," was the common retort of my more secular friends, many of whom went on to cast their vote for technocrat Hamdeen Sabahi in the presidential race that spring. Yet when the Muslim Brotherhood's Mohammed Morsi was declared the country's president in June 2012, the noisy celebrations of his jubilant supporters echoed through the streets of my neighborhood. A decade earlier, in 2002, a similar atmosphere - one of possibility, hope and apprehension - enveloped Turkey as it prepared for general elections, a vote that gave rise to the country's own Islamist-leaning government and Recep Tayyip Erdogan, who would become prime minister. Turkey's Islamist forces, embodied by Erdogan and his Justice and Development Party (AKP), had taken years to fight their way to the top of Turkish politics, edging out their more secular and liberal rivals along the way. Now president, Erdogan continues to dominate the country's political scene, and in spite of a recent failed coup attempt, both he and his party appear to have a long future ahead of them. The North East is located at a crossroads between three major economies – East Asia, South Asia and Southeast Asia. This geopolitical advantage, has however, not really translated into the region’s economic development. Despite the high growth in India’s trade ties with Southeast Asia and China in the recent past, the region’s role has been marginal in terms of its contribution to trade and as a trade route. The NE region has not been able to integrate and benefit from the various regional and sub-regional initiatives that neighbouring countries have created. Any mention of North East (NE) India in strategic circles revives memories of the 1962 debacle. Despite the humiliating defeat then, the development of infrastructure in the area has been on the backburner for many years now. To the average Indian, the North East is generalised as Assam and many would not even know the names of all the States in the area! 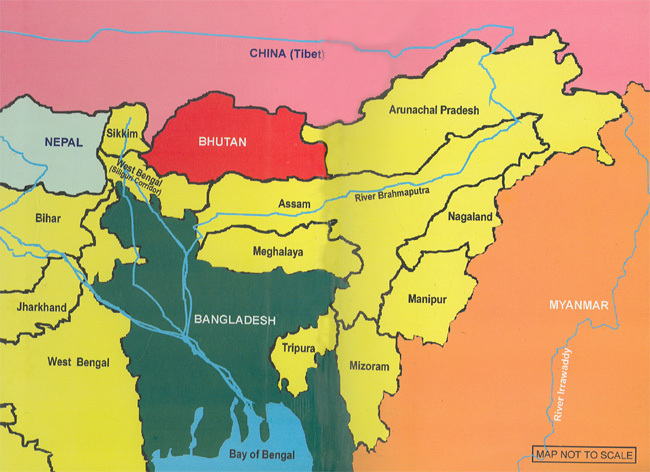 The region comprises eight states – Arunachal Pradesh, Manipur, Meghalaya, Mizoram, Nagaland, Sikkim, Tripura and Assam. Occupying eight per cent of India’s geographical spread, the states are home to only four per cent of the country’s population, while Assam accounts for 68 per cent of the population of the area. How Do You Solve a Problem Like Pakistan? In Kashmir, there’s an external factor on the other side of the border that needs to be handled diplomatically. Let me at the onset settle the core issue that worries every Indian. Nations with stable democratic governments, professional Armed Forces and nuclear weapons do not part with their territory. The state of Jammu & Kashmir (J&K) is an inalienable and inseparable part of India. It is and will remain central to the idea of India. The only issue before us is to thwart the challenges and threats to this idea. The problem in J&K has an external and an internal dimension. The external dimension is Pakistan and the internal dimension is the insurrection in J&K. Both are interdependent. Wage a deniable Fourth Generation War (4GW) in J&K and hinterland of India exploiting its fault lines. Avoid a conventional war and if it is forced upon it, stalemate India with conventional capability, ‘irrational’ nuclear brinkmanship, and actual use of tactical nuclear weapons if required. 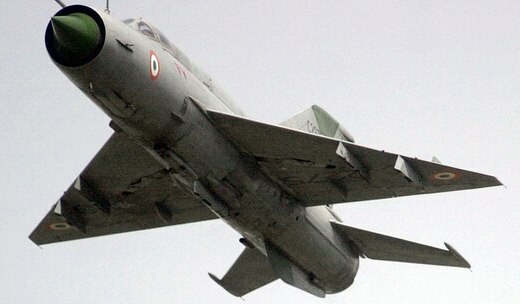 Quid pro quo response to Indian threat below threshold of war in the form of surgical air/drone/missile strikes and Special Forces (SF) operations. Control India-sponsored 4GW (as Pakistan perceives it) in Balochistan, Khyber Pakhtunkhwa, Federally Administered Tribal Areas (FATA) and the hinterland and expose it diplomatically. Neutralise India’s influence in Afghanistan by facilitating Taliban’s return to power. Back the above strategy with diplomacy and special relationship with China, Islamic countries and USA. President Xi’s visit was an effective and a graphic demonstration of China’s growing influence and outreach in the English-speaking Caribbean region, coming at a time when the United States (US) had been somewhat less forthcoming with financial grants for the region. U.S. aircraft carrier group(Photo : US Navy) A war between China and the United States will be a conventional war in which China will suffer very severely, whether the war takes place in the next few years or by 2025, said a new report by U.S. global policy think tank the Rand Corporation. There is no possibility of a Chinese victory in this war. The "First Sino-American War" will only be fought in the air, at sea and in cyberspace. Its likely battlefields will be the South China Sea, the East China Sea and the Chinese mainland. It will be the first conflict involving the U.S. and China since the Korean War from 1950 to 1953 that ended in an Armistice. The First Sino-American War will see U.S. aircraft and missiles strike the Chinese mainland while China will be unable to attack the continental United States because it lacks the long-range strategic weapons such as aircraft carriers and long-range supersonic bombers to do so. China can only use cyber warfare against the American homeland. Rand predicts the war will end in a bloody stalemate that will have catastrophic consequences for the economies of both the U.S. and China -- and the world. There is also the likelihood of a Second Sino-American War. Coinciding with National Security Advisor Susan Rice’s recent trip to China, the White House released a statement from Rice on the U.S.-China relationship in which she opined, “There is no more consequential bilateral relationship than the U.S.-China relationship…” As such, some knowledge of China would benefit most members of the War on the Rocks tribe. With August’s arrival and the beaches or mountain lakes beckoning, now is a good time to catch up on some of the interesting and important China-related books that have been published in the last year or so. A surprising number of the books today are accessible to the generalist, even to those with just a passing interest in China. The ascension of Xi Jinping to China’s highest offices at the 18th Party Congress in November 2012 sparked a sea change in Chinese politics, whether we attribute that shift to the Chinese Communist Party (CCP) or to Xi’s brand of politics. There is considerable debate about whether President Xi is powerful, whether collective leadership continues, and whether opposition exists within the party. Useful work is now appearing about Chinese politics under Xi. While much of it remains speculative, the quality is rising steadily as Xi’s rule provides more data on a daily basis. Japan’s 2016 Defense White Paper expresses “deep concern” over China’s growing assertiveness in the maritime domain. 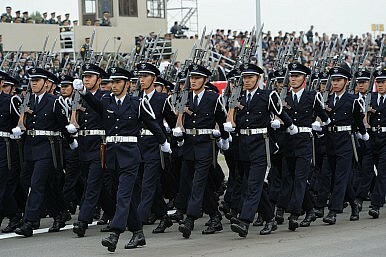 On August 2, Japan’s Ministry of Defense (MoD) released its annual defense white paper, titled “Defense of Japan 2016,” approved by the Cabinet of Japanese Prime Minister Shinzo Abe, stressing the growing assertiveness and military buildup of the People’s Republic of China in the Asia-Pacific region. Japan is, in particular, concerned over China’s land reclamation activities in the South China Sea and creeping militarization of the waters, which has triggered a regional arms race. “There has … been a noticeable trend among neighboring countries to modernize and reinforce their military capabilities and to intensify their military activities,” according to the MOD report. Ever since 1989, China has consistently increased its defense budget by double-digit numbers, according to the Japanese MOD and embarked on a rapid modernization program: “China is currently carrying out [military] reforms (…) which some see as being the largest in the country’s history. (…) “Recently the reforms have taken place at a rapid pace.”Enjoying this article? Click here to subscribe for full access. Just $5 a month. It is more than two weeks since the abortive coup on the night of 15-16 July took place in Turkey. Although additional information has become available, it is still not clear who the mastermind behind the failed attempt was. It is, however, possible to piece together the sequence of events with a fair degree of accuracy. It appears highly unlikely that President Recep Tayyip Erdogan was in any way associated with the plot. While condemnation of the frail and reclusive Turkish cleric Fethullah Gulen by Erdogan and calls for his extradition from the United States where he has been living in self-imposed exile since 1999 have become increasingly louder, well informed Turkish analysts dismiss the charge that Gulen could have been directly involved in the coup attempt. Gulen’s supporters have denied any role and termed the Turkish government’s accusation as “highly irresponsible”. Gulen has long been an ardent advocate of tolerance, peace and “acceptance of religious and cultural diversity” based on the traditions of Sufism. In a recent op-ed in the Wall Street Journal, Gulen had denounced the Islamic State, called for an end to violent extremism, and advocated equal rights for men and women, and education for Muslims. Gulen and Erdogan were once friends but split several years ago after allegations of corruption were levelled against senior officials as well as against Erdogan’s son. The American military is reentering a period of competition. For the 20 years following the collapse of the Soviet Union, the U.S. military reigned supreme, nearly unchallengeable in any state-on-state contingency that Washington might seriously care to take on. This meant that a whole generation of U.S. policymakers and military professionals became accustomed to U.S. military dominance, a dominance that enabled, and in some cases even propelled, a more ambitious and assertive foreign policy. Yet as the Pentagon has been making increasingly clear in recent years, this long-accepted ascendancy is now in question. The conventional military buildup of China’s People’s Liberation Army (PLA), Russia’s sophisticated modernization of its nuclear and nonnuclear forces, the proliferation of nuclear arms to North Korea, and the general diffusion of advanced technologies associated with the Revolution in Military Affairs all mean that U.S. military primacy is under increasingly severe stress. The Pentagon has already begun to take steps to try to respond to these troubling developments, including through its commendable new Third Offset Strategy and related initiatives. These are designed to leverage U.S. advantages in the development and exploitation of technology, in bureaucratic flexibility, and in military doctrine and training to extend U.S. conventional military superiority into the future. Hopefully this endeavor will pay off. What binds and divides the six Gulf Cooperation Council states? How will GCC cohesion evolve in the next ten years? How do underlying conditions (e.g., energy markets, security environment) and policy choices affect GCC cohesion? What is the current U.S. approach for adapting to the variable nature of GCC cohesion? How does this factor affect U.S.-GCC cohesion? How do U.S. planners and policymakers adjust to the peaks and valleys of GCC cohesion? The cohesion of the Gulf Cooperation Council (GCC) — defined here as the ability of the six GCC member states to act together or in parallel — has significant consequences for regional stability and U.S. interests. This report examines factors that bind and divide the six GCC states — Bahrain, Kuwait, Oman, Qatar, Saudi Arabia, and the United Arab Emirates — and presents the outlook for the GCC's evolution over the next ten years. Addressing the political, economic, and security dimensions of GCC relationships, the study provides a framework for understanding intra-GCC dynamics, an expectation of future developments, and policy recommendations for enhancing stability and U.S. regional interests. In the 2012 Israeli documentary “The Gatekeepers,” six former directors of Israel’s internal security service talked about the aggressive actions they took to protect Israel from terrorism. But they also talked candidly about their frustration with their own government for not coming to a settlement with the Palestinians. Why? Because without a lasting peace, new Palestinian terrorists were stepping onto the battlefield faster than Israeli security forces could remove them. The directors were combatting the symptoms while their political leaders failed to address the disease. The message of “The Gatekeepers” has parallels in our fight against jihadist groups such as the Islamic State in Iraq and the Levant (ISIL) and al-Qaeda. For every 1,000 hours we spent in the Situation Room talking about how to stop existing extremists from attacking us, we spent perhaps one hour talking about how to prevent the creation of terrorists in the first place. And, for every million dollars the U.S. government spent on stopping those trying to attack us, we spent perhaps one dollar on countering radical extremism. The United States has, since President Obama’s first term, taken steps on what is called countering violent extremism (CVE), but these efforts have paled in comparison to our “hard” counter-terrorism operations. People cannot, they cannot believe that President Obama is acting the way he acts and can’t even mention the words “radical Islamic terrorism.” There’s something going on. Obama has insisted that groups like the Islamic State and lone wolf attackers are not truly Islamic. He has referred to the group as “thugs and killers, part of a cult of death.” Secretary of State John Kerry has said the Islamic State is full of apostates. Hillary Clinton mentioned “radical Islamism” in the aftermath of the Orlando shooting, but also criticized Trump for thinking these were “magic words.” Obama also dismissed the phrase as “a talking point,” remarking in an interview that his choice not to say “radical Islam” was simply tactical to avoid surrendering “the mantle of Islam” to extremist groups. This back-and-forth over terminology can appear exceedingly banal, but understanding what fuels religious extremism and violence can also have major policy implications. Whether they are cognizant of it or not, politicians on both sides reflect a longstanding American disagreement over the nature of religious extremism. Russia needs to recognise the above reality more forcefully as implicit in the above Chinese strategies is displacing Russia’s existing strategic equivalence with the United States and a return to the US-Russia bipolar global management of security and stability that held the peace during half a century of the Cold War, even though that peace may have been imperfect. China since 2008 or so, and more particularly since 2012, has only indulged in disruptive aggressive military brinkmanship. A century ago this month, Europeans stood on the brink of a war so devastating that it forced historians to create a new category: “World War.” None of the leaders at the time could imagine the wasteland they would inhabit four years later. By 1918, each had lost what he cherished most: the kaiser dismissed, the Austro-Hungarian Empire dissolved, the tsar overthrown by the Bolsheviks, France bled for a generation, and England shorn of the flower of its youth and treasure. A millennium in which European leaders had been masters of the globe came to a crashing halt. What caused this catastrophe? President John F. Kennedy enjoyed needling colleagues with that question. He would then remind them of his favorite answer, quoting German Chancellor Theobald von Bethmann Hollweg: “Ah, if we only knew.” When, in the Cuban Missile Crisis of 1962, Kennedy found himself “eyeball to eyeball” with Soviet leader Nikita Khrushchev, making decisions that he knew could mean quick death to 100 million people, he reflected on the lessons of 1914. At several decision points, he adjusted what he was inclined to do in an effort to avoid repeating those leaders’ mistakes. Opec's worst fears are coming true. Twenty months after Saudi Arabia took the fateful decision to flood world markets with oil, it has still failed to break the back of the US shale industry. North America's hydraulic frackers are cutting costs so fast that most can now produce at prices far below levels needed to fund the Saudi welfare state and its military machine, or to cover Opec budget deficits. Given the tortuous manner in which the American political system has been functioning the past decade, can a case be made for the United States to switch over to a different sort of democratic political system? While the sacrosanct status of the U.S. Constitution makes any formal change unlikely, it is still interesting to speculate over whether or not a parliamentary system would be more suitable for the United States, as well as for other countries with presidential systems. A parliamentary system of government is preferable to a presidential system. Parliamentary systems are common throughout much of Europe, South Asia and many former British colonies. Parliamentary systems are characterized by executives, usually called prime ministers, who derive their legitimacy from an assembly or legislature, usually called a parliament, after the “mother of parliaments,” in Britain. The executive is the head of government and is usually a member of the legislature and also held accountable to that legislature. The executive is thus separate from the head of state, who is usually a ceremonial monarch or president. On the other hand, in presidential systems, the head of government is also the head of state and is in charge of an executive branch that is separate, and elected separately, from the legislative branch. The United States and most countries in Latin America, as well as Russia feature this type of system. The executive in this systems tends to have great power. The concept underlying this system is the separation of powersthat played a major role in American constitutional thinking. The attempted coup in Turkey raised so many questions that experts and journalists seemed eager to cover other events happening around the world, rather than untangle the situation in Turkey. Still, there is one very clear result of the coup: Western countries should take caution when executing foreign policy based on liberal idealism. The dramatic events in Turkey reminded everybody that there is a limit in international relations for how far even the most powerful countries can go in promoting democracy without damaging their security stance. The debate between two camps of academicians and policymakers on whether foreign policy should be defined by virtuous ideas or by specific national, primarily security, interests is decades, if not centuries, old. Not long ago, after the end of the Cold War, it seemed that that debate was over—at least on the doctrinal level. The collapse of the Soviet Union was associated with the American foreign policy of democracy promotion and global engagement based on the determination to protect the Western values of market economy, free elections and human rights. Therefore, Western politicians and even scholars declared that not only was this ideology triumphant, but that a foreign policy based on this Western ideology is the only right choice for statesmen to take. And in months of follow-up conversations about the DNC’s network security, the FBI did not warn party officials that the attack was being investigated as Russian espionage, the sources said. Did Iran Attempt to Hack Syrian Dissident Living in Turkey? PARIS (AP) – Syrian opposition activist Noura Al-Ameer was combing through her emails late one night when a message caught her eye. The sender was “Assadcrimes” and he promised information about Iranian meddling in the Middle East. But the email seemed odd. Al-Ameer turned to her husband, cybersecurity trainer Bahr Abdul Razzak, in their small, book-cluttered home in the Turkish city of Gaziantep. “Have you heard of this group before?” Al-Ameer asked. Abdul Razzak, a fellow at internet watchdog group Citizen Lab, quickly determined that the group was bogus. The email, sent on Oct. 3 last year, was an electronic trap - one of hundreds of malicious messages that have flown back and forth as rebels grapple with the government of Bashar Assad in Syria. This one had been aimed at snaring Al-Ameer in particular; the website registered by the hacker was in her name, suggesting an attempt to steal her identity. Al-Ameer is a well-known opposition figure, and stealing her data or her identity could have been the jumping off point to attack other Syrians in and out of the country. The chart below is an update for one of our infographics from December 2015. This chart shows the number people killed as a result of terrorist attacks in Western Europe from 1970 to July 28, 2016. The chart below is an update for one of our infographics from December 2015. This chart shows the number people killed as a result of terrorist attacks in Western Europe from 1970 to July 28, 2016. Between the summer of 1936 and 1938, the regime of Joseph Stalin summarily executed 750,000 Soviet citizens without trial or any legal process. In the same period, more than a million others were sent to the labour camps of the Gulag, from where many would not return. In the history of a murderous regime, this was a period of exceptional state violence perpetrated against its own people. The episode has always held a certain macabre fascination, but there are other more substantial reasons for drawing attention to it as we reach the 80th anniversary. In 1991, and then again in 2000, huge volumes of archival materials - millions of documents - were released to historians. It has taken years to digest this material and make sense of it, but new and striking findings have made it possible to rewrite the history of what has come to be know as the Terror, or the Great Purge. My recent book The Great Fear is one example of this. These findings help us better understand contemporary Russia, its current, authoritarian leader and the reverence many Russians continue to feel for Stalin. In the West, the public perception of Stalin and the Terror lingers from the period immediately after the dictator's death in 1953. His successor, Nikita Khrushchev, wanted to limit the power of the fearsome Soviet political police. But he also wanted to communicate to the Soviet political elite that they would not be blamed for the violence of the Stalin era, though they had been deeply and directly involved. So Khrushchev blamed the Terror on Stalin and his "cult of personality", and historians in the West followed his lead. They - particularly following the lead of Robert Conquest in his 1967 book The Great Terror - presented Stalin as a bloodthirsty, paranoid, political opportunist determined to secure total power over all other considerations. The Terror of 1936-1938 was therefore understood as the culmination of a drive to create a personal dictatorship.